← Why do I have this blog anyway? I applied to Clarion West again this year, and did not get in. Rejection is a normal part of the writing life. I know that. We all know that. I honestly have no problem with submitting a story to a publication and the story getting rejected. I know it’s the story that’s being rejected, not me. For anyone who doesn’t know, Clarion West is a six-week, 24/7 intensive writing workshop. Just sending an application is a huge commitment. Putting aside a huge lump of money. Figuring the mechanics of how someone else will take care of my responsibilities as I (potentially) remove myself from the lives of my loved ones for six weeks. The application consists of two parts. 1) A 20 to 30 page short story in standard manuscript format; about 4000 to 6000 words. 2) A 700-800 word essay telling them about yourself. For me, the essay was much, much harder to write than the story. The essay is personal. Unlike my short story, the essay absolutely IS me. 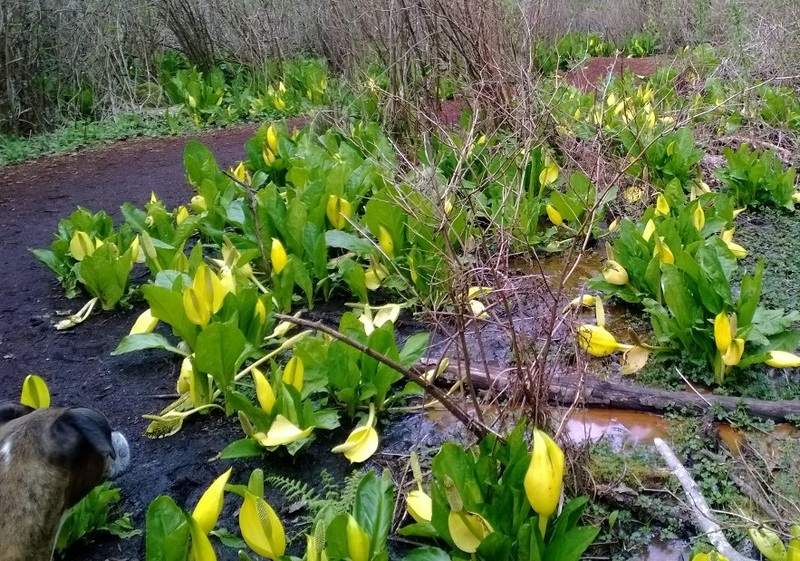 Skunk cabbage blooming at the Mercer Slough on 1 April 2014. Pretty and stinky – it must be spring. Yeah. I really hate writing the two-page book report of my life. The whole process of applying to Clarion West triggers my inner demons in a way that the submission/rejection process never does. After more than twenty years of recovery, it jars me into the realization that deep down, I will always have codependency issues. From the time the application window closed on March 1st, to March 14th when someone-who-would-know tweeted that the acceptance phone calls had started, to March 22nd when I finally received the rejection email. The wait (and everything that goes with it) was agonizing. This year was even worse for me than last year. I love to write. I’ll keep on writing, and I will continue to submit. Rejections really don’t bother me because like I said, it’s not me it’s my story — easy peasy. Right now, I don’t know if I will apply to Clarion West next year. Six whole weeks of immersion in the craft of writing would be pure heaven for me. But the price of that lottery ticket is painful. Also, the summer of 2015 will be particularly busy with family commitments, so disappearing for six weeks may be impossible. Two friends, one a close friend, will join the 2014 Clarion West class. I am really, truly happy for them and their class mates. My most sincere congratulations to all eighteen of them. This entry was posted in Life, Writing Path and tagged rejection, writing. Bookmark the permalink.